The scarlet macaw, sometimes referred to as the red and yellow macaw, is the largest and most brilliantly colored of the Mexican parrots. It is the one so often seen in travel brochures. The sexes look alike. The bird is 31 to 35 inches long. It is brilliant red, with red and gold wings, and two-tone primaries that are blue or blue-green above and red below. The lower back, rump, upper and under tail are light blue. The tail (longer than the body) is red with blue at the tips. 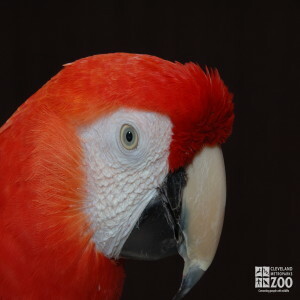 The range of the scarlet macaw includes Mexico, Central America, and northern South America to Brazil. The scarlet macaw inhabits humid lowland forests and savannas. Scarlet macaws flock in groups of up to 20. They feed high in trees and squabble noisily if disturbed. They have a loud, raucous squawk. In late afternoon they fly to preferred sleeping trees and remain there for the night. Pairs often engage in mutual preening before darkness. Scarlet macaw pairs separate from the flock during the breeding season. Most of the nesting places are cavities in palm trees, but cavities in any large tree or holes in the earth of sloping banks are also used for nests. The same nesting site is used by a pair year after year. The eggs are incubated by the female only. Both parents feed the young by regurgitation.